Hewlett-Packard has experimented with augmented reality and 3D image manipulation in recent products, and it intends to bring some of those technologies to tablets and laptops for a more interactive computing experience. The PC maker says its mobile devices will let users play with 3D images that can then be created in a 3D printer. It’s a feature that already exists on HP’s US$1,899 Sprout all-in-one desktop, but it will make its way to a range of mobile products from HP in the future. Also coming to HP’s laptops and tablets will be features that bring augmented reality to real-world applications, said Ron Coughlin , senior vice president and general manager at HP’s PC and printer division, in an interview on Tuesday at an HP event. “On immersive computing, you’ll see us take it across segments, across form factors, and across usage [models],” Coughlin said. HP wants to differentiate its products in the look-alike PC market, and Sprout provides a glimpse into what desktops could be like years from now. Sprout, which uses Intel’s 3D RealSense depth-sensing camera, allows users to scan an object, then manipulate the image on a specialized Touch Mat surface and then print the resulting object on a 3D printer. At CES, HP also showed its new 23.6-inch Zvr “virtual reality” monitor, which projects 3D images into thin air. Those images can be navigated, zoomed and manipulated using a stylus without touching the screen. 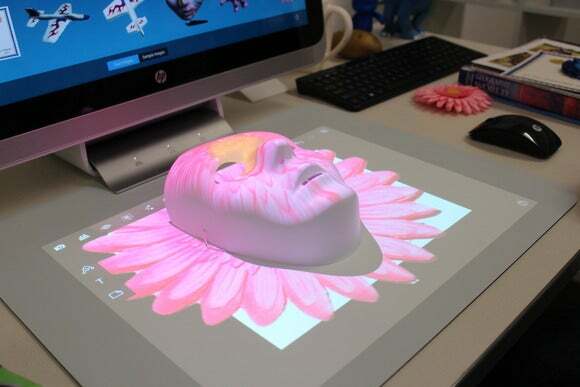 HP’s providing a new spin to 3D technology with the Sprout PC and Zvr monitor, and the products are closely tied to the company’s emerging 3D printing strategy. “We provide the on-ramp from Sprout and immersive computing, and off-ramp with 3D printing,” Coughlin said. Trickling down from the Sprout into tablets will be the Workspace software, which allows users to share and manipulate 3D images. The Workspace software layer is built on top of Windows 8.1. HP wants to bring immersive computing to a wide range of products cutting across different price ranges. The ability to capture and modify 3D objects on PCs may be one of the drivers for growth in HP’s 3D printing business, Coughlin said. HP announced its first 3D printer late last year for release in 2016. HP wants to remain on the offensive with new innovations as the company prepares to split into HP Inc., which will be in charge of PCs and printers, and Hewlett-Packard Enterprise, which will deal in enterprise software and hardware. “If anything, we see ourselves being more aggressive,” Coughlin said. 3D TVs and displays have been around for many years, though the need for special glasses has put a crimp in their popularity. But continuing advances are giving new life to 3D in computers. Dell’s new Venue 8 7000 tablet, which also has Intel’s 3D depth-sensing camera, can measure the distance between objects. Intel’s hoping its 3D cameras will also be able to identify objects and people’s moods.